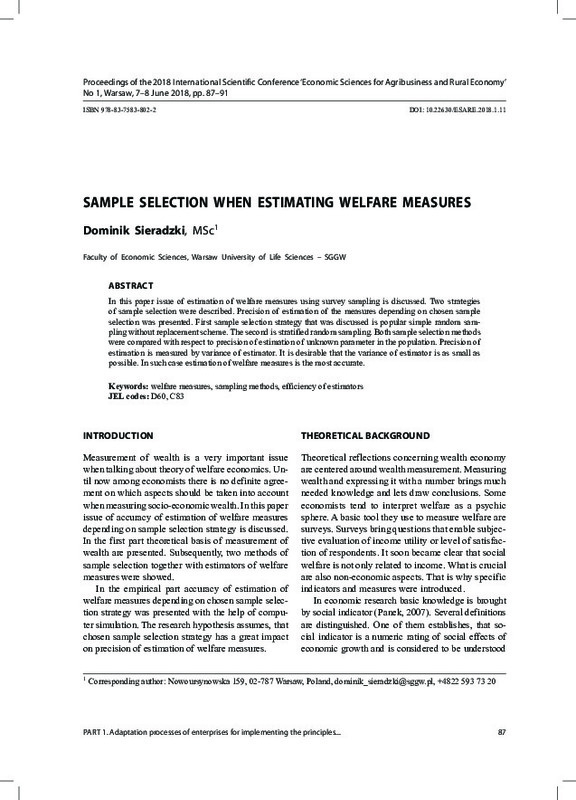 In this paper issue of estimation of welfare measures using survey sampling is discussed. Two strategies of sample selection were described. Precision of estimation of the measures depending on chosen sample selection was presented. First sample selection strategy that was discussed is popular simple random sampling without replacement scheme. The second is stratified random sampling. Both sample selection methods were compared with respect to precision of estimation of unknown parameter in the population. Precision of estimation is measured by variance of estimator. It is desirable that the variance of estimator is as small as possible. In such case estimation of welfare measures is the most accurate.